The Rai d’Or, next to Brown Street car park in Salisbury, has a colourful history spanning over 700 years. It has recently reverted to the name it last had in the 1850’s, and also historically when it was a house of ill-repute in the Middle Ages. The name, Rai d’Or, means a ray or beam of golden light with the name having its origins in French heraldry. Its most famous landlady was Agnes Bottenham, who gave part of her extensive property in Trinity Street behind the pub to found Trinity Hospital in 1370 as a penance for her sins and to house retired prostitutes. At that time the area was a red-light district with Love Lane around the corner as the centre of the trade. The present building dates from the 16th century and is on the site of the original house of ill-repute built in the 13th c. to service the needs of the craftsmen constructing Salisbury cathedral. Two separate tenement houses were joined together to create what became the Star. The most historic and interesting part of the building is the roof, with huge timbers some of which date back to the 12th century. The bar was re-roofed sometime after its rebuilding so that the 2 houses could be given a single roofline facing Brown St. The corner tenement still retains traces of the external double staircase with a balcony where the ladies could show themselves. The smaller inner tenement has a fine inglenook fireplace which is now the centre of the main bar area. It is also the place where the Doctor, one of the 5 resident ghosts, can sometimes be seen. It is difficult to establish when the Rai d’Or ceased to be a house of ill-repute but it is likely to have been in the early part of the 19th c. when the moral tide turned against the ancient profession. However these activities are likely to have carried on until more recent times although in a less public way. The Rai d’Or can certainly claim to be a building with one of the most interesting histories in Salisbury. Although altered over the years, the Rai d’Or still retains the atmosphere of a traditional English pub even though it now specialises in Thai food. Real ale has also made a comeback after the recent history of being a lager pub. 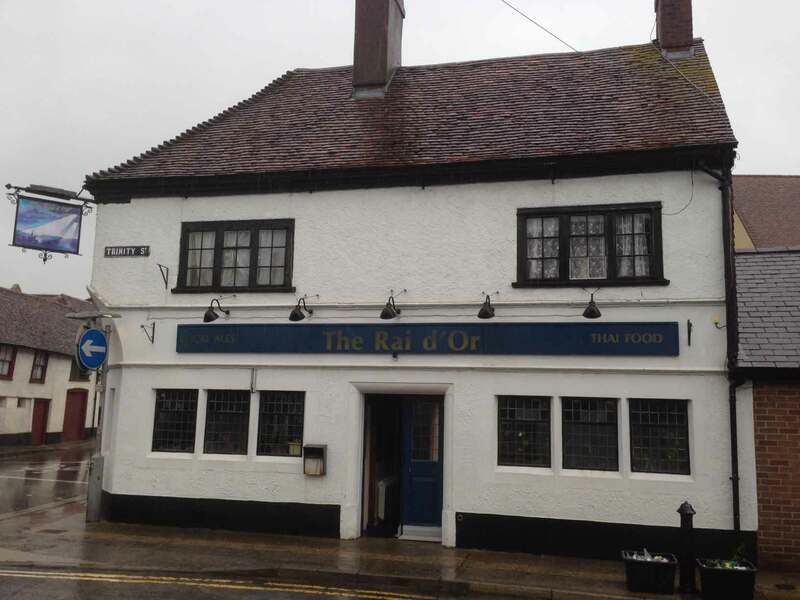 The Rai d’Or was in fact the place chosen by the Great Bustard Group for the recent launch of new ale, sales of which will help support the re-introduction of the great bustard onto Salisbury Plain. Profits from the house of ill-repute once paid for Trinity Hospital; now profits from ale will help to pay for the Great Bustard.